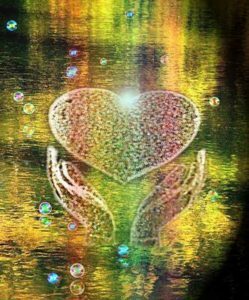 Welcome to the brand new Rainbow Bridge to Harmony & Healing Vibrational Bath Sacred Salts Page which includes Astro Aura Sacred Salts Colour & Numerology Reading information. 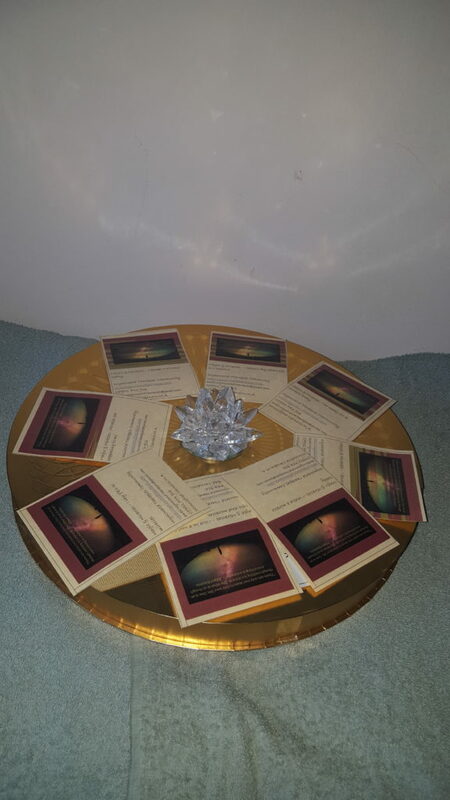 As a healer & therapist with 25 years of practice in energetic modalities in healing, counselling therapies & coaching including Aromatherapy, Aura Soma (colour healing) and Vibrational Healing, I have created these energy vibrational bath salts as a resource to my clients to help them to regain balance amongst other things in my work with them. 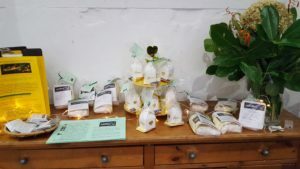 The salts were created in June 2018 for the Rainbow Bridge to Harmony and Healing Workshop and after following my divine guidance. I had been working with the salts for 20 years plus but never on a public platform and its what I used to get though teaching weekends or 18 hr days ever since my journey in holistic therapies began 25 years ago. Bathing in bath salts is not new! Throughout time, salts have been reported on for the value, both in the bible and in history, salt was such a powerful commodity that it was used as a medium of financial exchange. Of course in early history, we did not have a composition of breakdown of salts and what the minerals did to our body, that came later with the understanding of biochemistry and advancements in science. 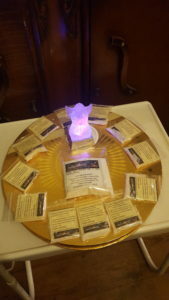 These are extremely powerful vibrational salts that will act on a molecular level with your aura and energy field and as an added bonus the salts can also be left in a room to purify the atmosphere and leave behind a pleasant aroma as well – so they are a good aid for space and energy clearing. 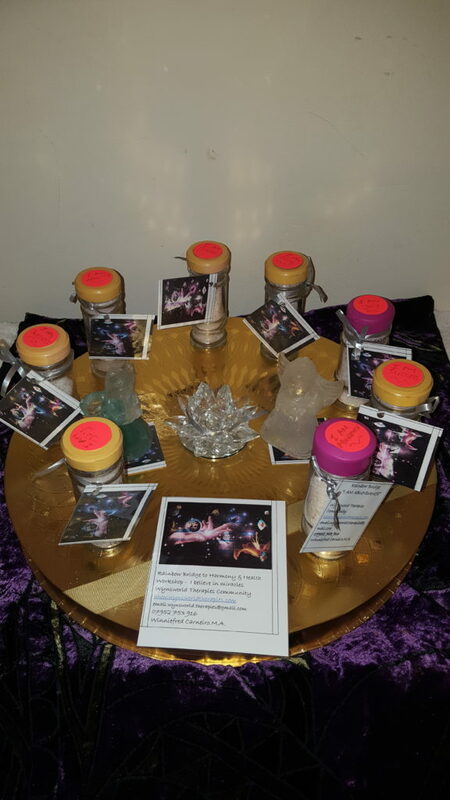 I was led to create these powerful salts using traditional blending means and esoteric vibrational energy healing into the mix – energy frequency for the 21st century. I am passionate about working with tools that help our wellbeing and maintain a positive mind-set by bringing harmony and balance to the body and the mind through our senses & beyond. The salts are designed to clear, rejuvenate and bring balance to your body and mind on the rainbow bridge of light – meaning the chakras and hence the name of the salts, and the emotional connection we have with the body and our energy fields and of course the element of water as the body is made up of 60% water. Our thoughts and emotions can affect us on physical, mental and emotional levels. 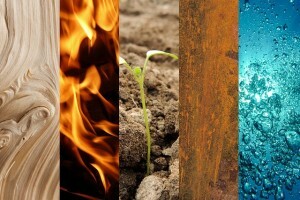 There is a link between mind & body, emotions & illness & when we are stressed we hold tension in the body. The salts are designed to work on an energetic level using harmonic and vibrational healing, using amongst others sound, colour, light frequency and of course salts. The salts having their debut for sale Unity Celebration day July 28th 2018 at St Ethelburgas Church in London. The pack also has an affirmation to help you create a positive mind set. We reflect what we think so positive affirmations are a great way to promote positive self talk and reduce stress. 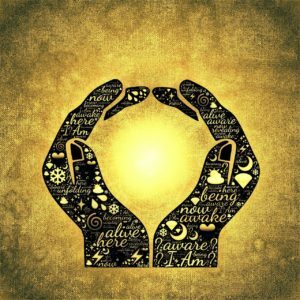 There is more on mindset in my metaphysical page and what the “I AM” presence is about in relation to affirmations. Where there are energy blocks the salts will help pinpoint them on a causal field and when you work with them as in custom blending I can go deeper in removing any blocks in a session. The light rays you see on the wall are the colours of the energy reflected back as I create the salts and your affirmation cards. This is literally the energy that bounces off the walls and into the packs. These are powerful hand mixed salts, blended with a combination of natural sea & mineral salts such as Epsom, Pink Himalayan, Magnesium, Potassium & Dead Sea Salts which when combined contain natural ingredients such as magnesium, calcium, potassium, bromide and sodium hold vital nutrients & rich minerals our bodies needs when depleted. They act to keep the skin soft, smooth and supple. I only use pure sea and mineral salts with no caking agents added to the salts. 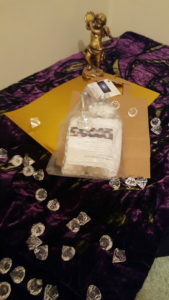 The vibration salts have been blended with carefully selected high grade essential oils to add to a positive experience and as an aromatherapist and healer I ensure that I use high grade pure essential oils – not perfumes or essences and the salts are approved for pharmaceutical/cosmetic use. Bathing with the vibrational salts means you can relax, revitalise and regain your balance and harmony, purify your skin, detox the body & calm your senses, ease tired and sore muscles and feel great. The benefits of bathing with sea salts are well known, but when mixed with rich mineral salts, essential oils & encoded with positive vibrational frequency using cutting edge energy modalities adds to a wonderful experience. This is why these are not normal bathing salts, it takes some time to prepare and infuse the salts to get them to the right vibrational stage because they act as a space clearing tool in the packaging itself and I only make up small batches at a time. Custom blended and astro blend salts take more time to prepare as I take a small case history to make sure you are not contra-indicated for the essential oils or herbs. The Vibrational energy bath salts can also be purchased unscented from this site. As a therapist and healer I am happy to custom blend the vibrational salts for whatever you feel you are in need of. Look carefully at the reflection of the lights on the wall as the salts have been energetically charged and ready to go out into the world. The colours on the wall should start to glow and change. No it’s not a trick of the light or some fancy technology.. (I don’t know much about technology) .. it’s energy, simple and pure. I recommend that you use the salts once to twice a week to clear your energy field especially when you find yourself in a toxic work environment or have had a very stressful day. or As a shower scrub: add 1-2 large tbs salts in a bowl, mix with either some shower gel, OR one teaspoon olive oil or some warm water & make a firm paste. Wet your body, massage paste into skin, rinse & dry body. If you have a preference for showers as opposed to baths, then I highly recommend you put the salts dry in your food blender and grind them down to a finer consistency so as to get maximum use of the salts as a paste in the shower. The salts are far too precious to waste otherwise. As Foot Bath: Mix 1-2tbs salts in large foot bowl with warm water, soak feet for 20 mins, dry feet well. As energy/space clearing – put a handful of salts in containers in different rooms in your home or if you wish to use them in an home or office space simply decant a handful into a little container and put them in a discreet corner of your office space where you are. In the home, put the containers in a corner of the room(s) and leave them to absorb the energy. Over time the salts will go hard and may discolour. When that happens, please dispose of salts by putting them in the sink and turning on the tap to let the salts dissolve and as you do so, visualising the water clearing out the old stale energy. You can always contact me to replace salts with a new blend. As you finish your bathing let go of all that is holding you back and allow the new energy to come in as your body absorbs all the minerals it needs and let’s go of toxins through elimination. The salts are very powerful so there is no need to use soap after bathing but you do need to clean your bath out in order to cleanse the space after using the salts. NOT suitable for bathing infants/babies/young children. Do not put salts near eyes/ if irritation occurs, wash skin with water. Seek medical advice if you have open wounds/serious medical condition/are pregnant/breast feeding/ diabetic/ suffer from high or low BP and are prone to fainting fits. If there is any adverse reaction do not use the salts. They start at 350g inc pp. However if you contact me to find out when I am exhibiting the salts at local venues you can buy at a special offer price on the day of exhibition and save on postage costs. I currently offer just a few types of sacred Salts which will be sold online and will come with clear instructions for use. As an aromatherapist I have used my skill with herbs, healing and harmony to prepare mystical and healing blends for safe use. The house blend No 1 will start at 400g inc pp and are a great way to get used to the energy blends. Relaxing Blend – Includes essential oils of Lavender and Geranium. Great for when you want to chill out and relax after a tiring day or want to sleep well for those restless nights. Induces calming effect in body and toning effect with the geranium to calm the nerves and lessen stress. Useful when you want to still the racing mind and bring insight and clear thinking. Enhances the memory, uplift’s Spirit, clears the thoughts. 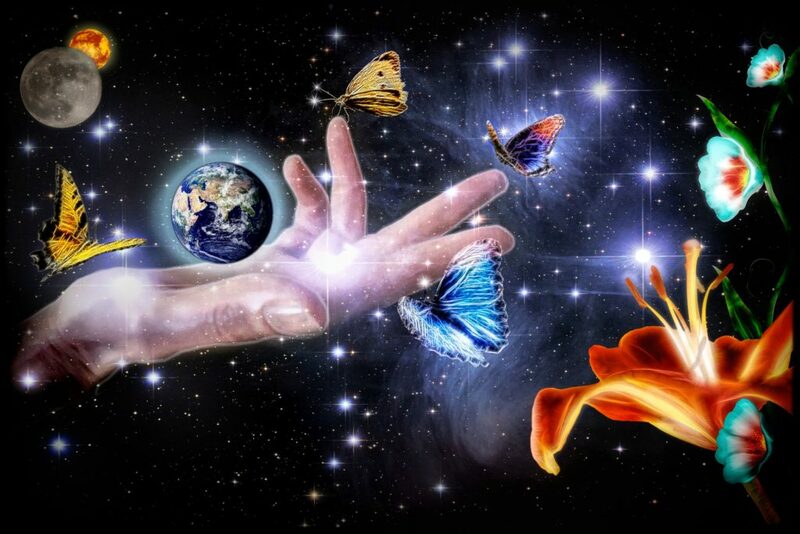 Encourages mental stillness and brings you into a protective environment in your auric field. 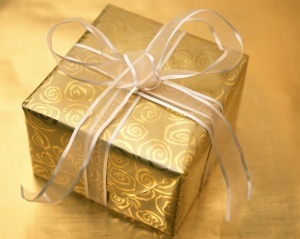 As above but come unscented for those of you who have sensitive skin or do not want essential oils/herbs in the blends. 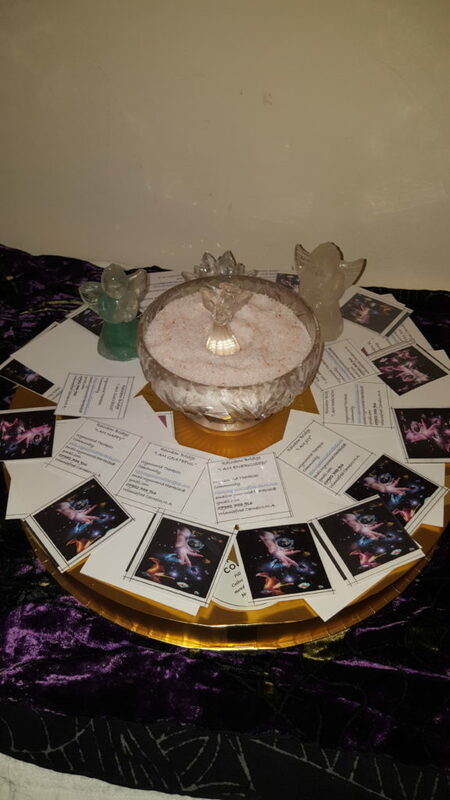 For a more powerful enhanced experience of my vibrational sacred healing bath salts I highly recommend you try two of my premier range of salts: Custom Blend and Austro Aura Soul Vibration Salts. Please note that Custom Blend will require a short skype/zoom online session so that I can ascertain the right blend for your needs and I will need to go through a 1hr booked consultation with you. Custom blend sacred salts are a shorter way to experience a holistic approach to mind/body/spirit rebalancing without the need to break the financial bank or resort to deep endless therapy though you may find that they start to unblock toxic energy situations you are facing and if you then want to undergo some short term work with me you can always go further. They sacred salts were created as a tool for my clients who wanted to know how it was I could do incredibly long hours when teaching and presenting or doing a full 16 hr days on my feet. One of the secrets I can reveal is the use of my sacred salts as an energy tool to help rebalance and calm my energy field. Winter blends to combat infections and energetic shower scrubs to start your day by clearing your mind, or calming salts at the end of the day to relax you. There is no limit to custom blending other than to say a blend is made up for you and is delivered at the end of a week because I make up blends freshly to order, they will be blended with essential oils and crystals and herbs if necessary and I will also do some kinesiology work with you to check that the blend is adjusted correctly for your needs and it will be encoded to work on an energetic level with vibrational frequency for wellbeing. 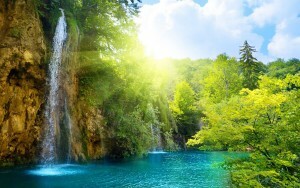 Includes a special metaphysical written treatment (positive spiritual affirmation) for your situation (written instructions will be given) and you can use this affirmation in your meditation as part of your recovery to wholeness and you will receive a voucher to use as a discount to use towards a therapy session online. Will come as a 500g (includes posting and packing) bag as Custom blends are for shorter term use as your situation changes energetically, so will you. All assessments/catch up calls will be online. An Astro Aura Sacred Soul Vibration blend is recommended if you are on your soul path and want to immerse yourself in it deeper or to get onto your path and help you reconnect with the essence of you through the energy of the elements and the medium of water which is a source of both purification and nourishment as an agent that heals us through nature. An auric angel space clearing hand blended spray with essential oils and crystals – I have been known to create space clearing sprays for use in offices that have no windows and 24/7 artificial light. These sprays are used to bring in our light vibration in harsh conditions. And as a bonus voucher to use towards any of the other services I offer as an integrative coach and workshop facilitator. 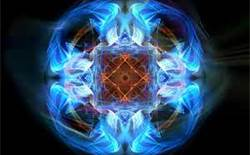 An 1.5 hr appointment will have to be made to secure the astro auric salts as an online consultation and reading will take some time to go through and the salts will take up to a week to prepare as everything will be hand blended and customised per order. All readings will be online via skype or zoom. The salts and essential oils can be changed as there are any number of combinations available for your star sign and personality profile in mystical aromatherapy blending. 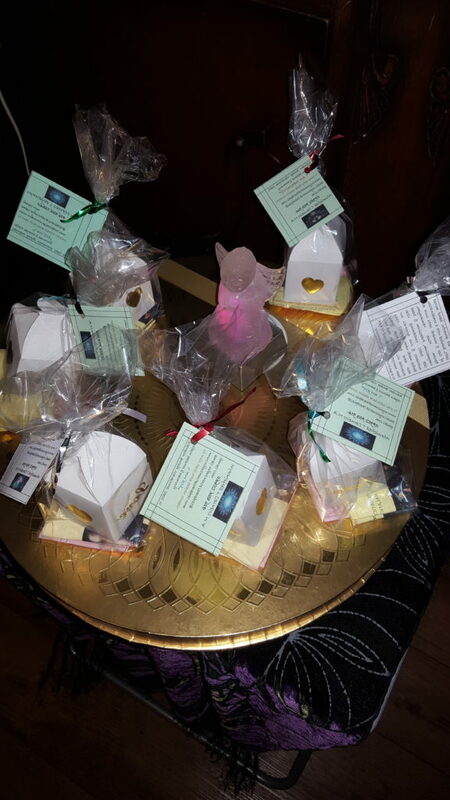 At present the Harmony Healing Vibrational Sacred Salts will only be available for purchase in the UK and online although I hope to have the pleasure of meeting you at any of the holistic fairs and festivals or personal development workshops that I may be speaking or facilitating at or offering you the chance to purchase the sacred salts in person.